The underlying structure of the SMT allows for additional sensor simulation to be added, creating a Sensor Mission Trainer (SMT). The combination of sensors and synthetic environment controlled by an Instructor via the SAF, permits the system to be operated as an integrated platform simulating a crew environment and promoting the development of CRM. When sensors are combined into an SMT (together with several complementary ISR sensors) the simulator exercises skills such as leadership, teamwork, CRM, human factors, communication, prioritization and decision making to optimize the individual assets to achieve the mission objectives. The overall result is that the SMT is able to provide operators, planners, taskers and commanders with unmatched ISR capability training: a force multiplier for modern aircrews. The SMT can be customized to specific user requirements, and can be delivered with associated training, thus immediately optimizing its capabilities in a training environment. It can be installed in a classroom as open architecture, or if required, mounted in consoles to provide the operator with a real station form factor. The procedural radar trainer is designed to offer the operator a multi-mode, generic radar with surface search, GMTI, IFF and imaging radar functions. This tests the operator’s thought and decision-making processes, applicable to radar, within the ISR context of the mission scenario. Scenarios are crafted to encourage the operator to consider height for range, height for task, priority sensor, aircraft safety, maritime operations, overland operations and tactical appreciation and aircraft positioning for task. The Electronic Warfare station allows operators to exercise the tactical considerations of EW, electronic intelligence and communications intelligence gathering. Frequency scanners detect emissions from radars and radios, and the associated direction finding (DF) equipment allows position fixing of those emitters. Radar ESM (RESM) operators are able to exercise parametric functional analysis and threat assessment and the system is suitable for standalone installations to use classified training material. The Communications ESM (CESM) equipment allows recorded messages to be detected, listened to and geolocated over frequency scanning radios, exercising the procedural thought processes and, if appropriate, tactical linguistic training. Other aspects of EW can be exercised at this station, including missile approach warnings, chaff and flare dispensing systems of a self-defense suite and electronic logging. 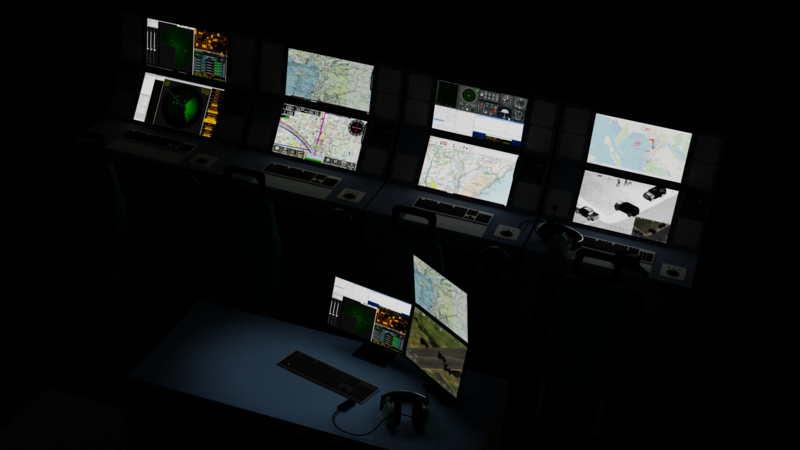 The electro-optic/infrared turret simulator and hand control unit enables the operator to exercise tactical procedures, image interpretation and reporting in a real-time synthetic environment. Integrating the EO/IR into the SMT sensor suite allows coordinated operations between other sensor positions to be exercised, improving communications, teamwork and airmanship. For example, radar may be detecting surface units with the EO/IR station assessing each, under the control of the Tactical Commander. Most marine vessels are now fitted with AIS beacons, broadcasting information about the vessels. However, the AIS data is often exploited by criminals to disguise their intentions or to conceal their identity. Co-ordinating AIS data with radar and EO/IR is crucial to identify suspicious vessels and to validate the AIS data before it is used tactically. The Tactical Control station allows a mission commander or sensor team leader to lead and manage the individual sensors and to maintain overall control of the synthetic aircraft with a “big picture” tactical overview. All sensors feed in to the tactical picture and individual sensor operators learn to package relevant tactical information to the tactical commander, improving general communication skills and airmanship. The tactical commander must manage the sensor team and synthetic aircraft flight deck effectively to ensure the mission is achieved. This allows standard operating procedures to be trained in a safe environment and cleverly crafted scenarios ensure that the tactical commander is faced with challenging tasks, exercising critical information assessment, decision making, crew resource management and mission needs.